The Ministry of Health, Seniors and Environment has revealed that Jeremy Madeiros, Senior Terrestrial Conservation Officer with the Department of Conservation Services, has been awarded the prestigious Blue Turtle Award  for the Cahow Translocation Project, helping to preserve the endangered Bermuda Cahow. Launched in 2009, the Blue Turtle Award is an annual award given by the UK’s Joint Nature Conservation Committee [JNCC] for nature conservation work undertaken by an individual or group of individuals, from an Overseas Territory or Crown Dependency, who have made a valuable contribution to nature conservation in their Territory or Dependency. A spokesperson said, “Mr. 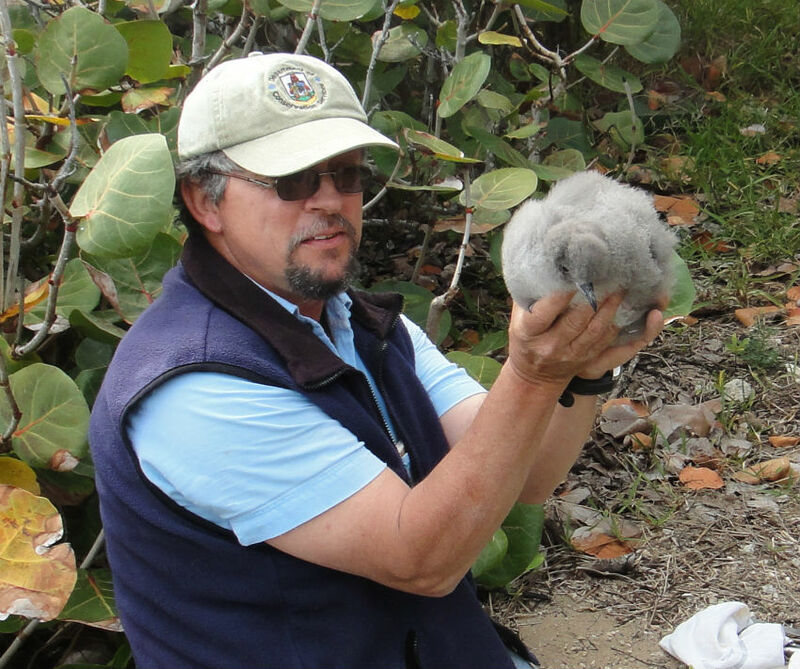 Madeiros was nominated for his work by the Bermuda Audubon Society and the JNCC review committee noted his dedication to nature conservation in Bermuda over the last 23 years and, in particular, his work over the last 14 years to conserve one of the world’s most endangered seabirds. The Minister of Health, Seniors and Environment Jeanne Atherden said, “On behalf of everyone in the Ministry, I’d like to extend my congratulations to Mr. Madeiros. It’s wonderful that his hard work and dedication to ensuring the recovery of Bermuda’s Cahow has been recognized by this prestigious international award. “This program has enabled the breeding population to begin a slow but accelerating increase from 18 pairs producing eight chicks annually to a new record number last year of 105 breeding pairs producing 53 successfully fledged chicks. “In 2013, following on from the success of this project, Mr. Madeiros began a second four-year translocation project to establish another colony on Nonsuch Island. The Cahow is a slow breeder, with the females only laying one egg per season, and spends most of its adult life out on the open seas feeding on small fish, shrimps and squid. On hearing that he was the recipient of this prestigious award, Mr. Madeiros said, “I am very surprised and honoured to have received this award, which I would like to accept on behalf of all of my fellow researchers, workers and volunteers, who have provided assistance and support for this challenging and demanding project. “Special thanks to Nicholas Carlile and David Priddell of the New South Wales Department of the Environment and Climate Change, for special inspiration, training and instruction, without which the translocation program could not have taken place. JNCC’s Overseas Territories and Crown Dependencies Programme Manager Tony Weighell, one of the award’s judges, said, “Jeremy has shown outstanding personal commitment to the conservation of the Bermuda Petrel. We are fortunate to have such a talented, caring and devoted steward of the environment in a place as small as Bermuda. Just goes to show why the Bermudian spirit is the best in the world, and it’s another example of how Bermudians are the /best/ at what they do. Thank you for what you do, Jeremy Madeiros! Congratulations to you on your well deserved award Jeremy. Bermuda is indebted to you and your conservation of the Cahow. Well done, Jeremy. Bermuda is better off for your hard work and contribution to her environment. Congratulations Jeremy! Very happy for you that you have been recognized for all your faithful and hard work for the Cahow (environment) of Bermuda, though we know what you do is not for “recognition,” as it is the core of who you are. Our best to you as you continue on this awesome path. God Bless. Should he be nominated for a MBE or I dare say a Knighthood? This is selfless and his work demonstrates an incredible amount of grit, dedication and sacrifice to the preservation of our bird the Cahow. Kudos Mr. Madeiros!